The boundless multiverse of Magic: The Gathering returns to comics! 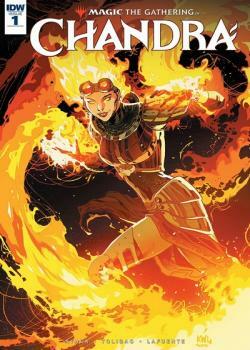 In the wake of tragedy, Planeswalker and pyromancer Chandra Nalaar strikes out on her own. On her journey, she’ll have to fight against threats both old and new, as well as her own sense of guilt. Can she overcome all of that alone? And who is that familiar face lurking in the shadows?